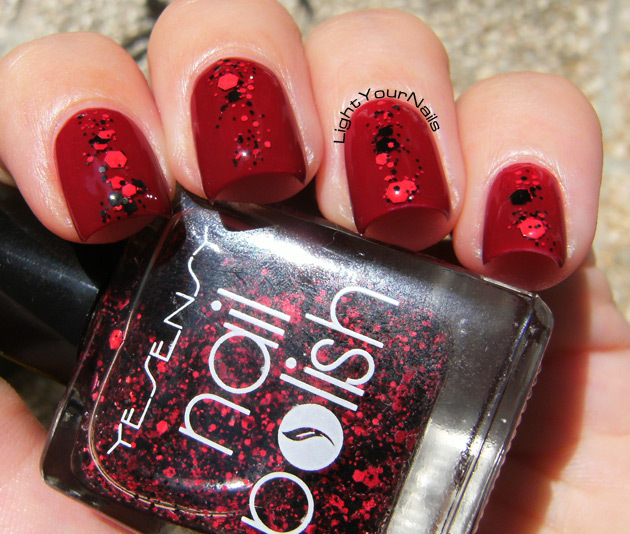 Yesensy red and black matte glitter | Light Your Nails! I am back with P2 Dating Time that I showed you yesterday. This is how I actually wore it on my nails. I just needed to spice it up a little bit! I grabbed this Yesensy glitter polish which has no name on it. It has a reference number which says 1526-220 but I am not sure it actually has to do with this specific colour. Anyway, this beauty consists of different sized red and black matte glitters in a clear base. I only brushed some of them vertically in the centre of each nail and coated with a generous amount of Gelous. I love how it seems that they float between the red base and the clear top coat! I only think I needed to dab for some extra big glitters on my middle nail. Ho preso questo glitter Yesensy che non ha un nome, e l’unico numero che ho trovato sulla boccetta è 1526-220 ma non so se sia il riferimento di questo colore in particolare. Cmq, questo smalto ha una base trasparente piena di glitter opachi neri e rossi di varie dimensioni. Usando il suo pennello ho dato una strisciata centrale verticalmente sulle unghie e ho coperto con una passata abbondante di top coat. Adoro come i glitter sembrino galleggiare tra la base rossa e il top coat! Solo avrei dovuto pescare qualche altro glitter grande per l’unghia del medio. I think this is my first matte glitter and I am totally in love with it! The colours are perfect, too. What do you think of matte glitters? Penso che questo sia il mio primo glitter matte e lo adoro! E poi i colori sono bellissimi. Voi che ne pensate dei glitter opachi? Such a simple thing to add to your nails but it looks so cool! This looks really cool with the glitter down the center. Love it how you only applied it in the middle, different! Gorgeous combo! I love how something so simple can really spice up a manicure! Thank you Jessica! I love adding glitters and this was a different way for me to do so! I'm nothing short of obsessed with the vertical line of glitters. So pretty! So different yet simple! Such a gorgeous glitter and I love how you used it - it looks amazing against the red base color. I like how the brighter glitter pops on the red background! This combo makes both polishes come alive! semplice da realizzare, ma con un effetto spettacolare, la amo! OK, this is flipping gorgeous! So simple, yet so stunning! I want this!!! This mani is perfection! Love! Bellissimo questo smalto! Io adoro i glitter neon opachi! Thanks for your comment! Sorry I don't post links.